The challenge of successfully juxtaposing new and old materials and styles has been successfully met on a newly renovated home in Sydney's inner-west. The Federation-style street elevation of the Haberfield home belies a remarkable transformation at the rear of the dwelling. Known as the 'garden suburb', much of Haberfield is designated a Conservation Area - meaning its trademark architectural style is fiercely protected by the local council. This made renovating and extending the home all the more challenging for the owners and their architect - moreso because they chose not to take the obvious route of mimicking the original style and materials. On the contrary, architect Sam Crawford believes you pay due respect to the original style by not copying it. "It (the original dwelling) has its on strengths, and is very much 'of its time'," he said. "We wanted to reflect the solidity of that existing form, yet at the same time provide a contrast. "The clients were very keen on concrete as an expression of the timeless nature of the old building, but used in a new, contemporary way." With what he described as 'a lot of pushing and pulling', Crawford and the owners were able to win Council over with a simple yet elegant design that captures and projects the spirit of the original. The transition point between old and new is a light-filled interior space where the original hallway and the new side entry/hallway dissect. The 'marker' for this transition is a stunning, curved insitu concrete wall that draws visitors into the newly renovated rear living spaces. This curved wall displays evidence of the formwork joins, as do the exposed concrete walls in the open-plan living area. Tie-rod holes are also evident on a number of internal and external walls, reflecting the rawness of the material. The rear façade of the new living space is also framed in insitu concrete, with the side and top beams extending outwards to create and overhang that protects the doors from light rain and sun. The outside edge of these beams reduces to a fine chamfer, with the top horizontal beam also changing dimension and angle along its length. Looking from across the yard, it looks like a slightly skewed picture frame. 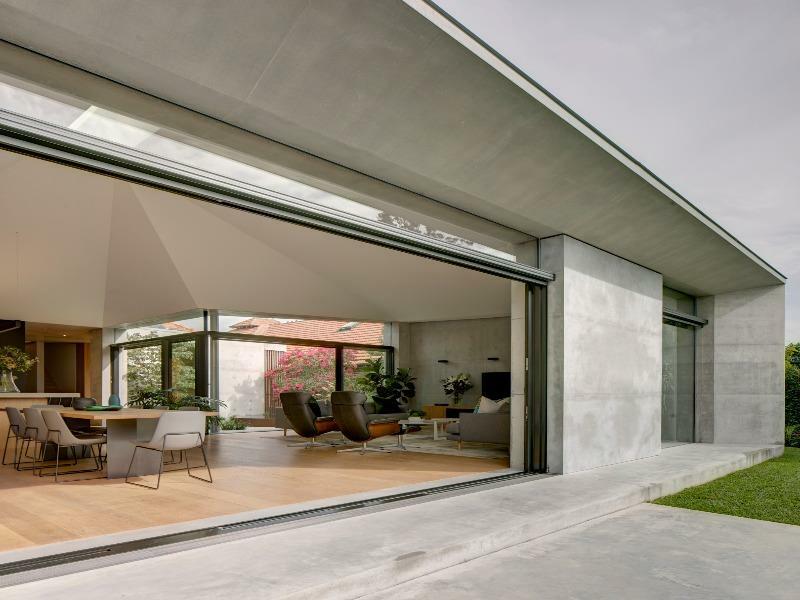 The use of double-glazing and the inherent mass of the double-skinned concrete walls help moderate internal temperatures in the new living spaces, in line with those in the original part of the house. Directly outside the living area is an in-ground pool. Behind the pool, the original double-brick garage has been opened up and re-envisioned as a cabana. Insitu-concrete paving, extending from the rear living area, around the pool and into the cabana, ties all the elements together. The polished concrete flooring in the cabana is complemented by a polished concrete sink/bench. Everyone involved in the project, including the owners are delighted with the final outcome - proof that the past and present can successfully co-exist in Sydney's suburban landscape.